and I steady my heart on the ground of Your goodness. and the foxes in the vineyard will not steal my joy. I lift my eyes to the hills where my help is found. Your voice fills the night raise my head up and hear the sound. I will trust in Your promise. I open my body to you, for it is your breath that fills and warms the lifeless clay. I open my eyes and ears to you, thankful for the light of your Word, which has brought me out of the shadow of ignorance. I open my heart to you, aglow with thanks for your love, filling me with compassion, understanding, and peace. I open my soul to you, grateful for your Spirit, who fills me with wisdom when I take a moment to listen. O Lord our heavenly Father, whose blessed Son came not to be ministered unto, but to minister; I pray for your blessing on all who, following in his steps, give themselves to the service of their fellow men. Endue them with wisdom, patience, and courage, that they may strengthen the weak and raise up those who fall; and, being inspired by your love, may worthily minister in your name to the suffering, the friendless, the lost, and the needy. 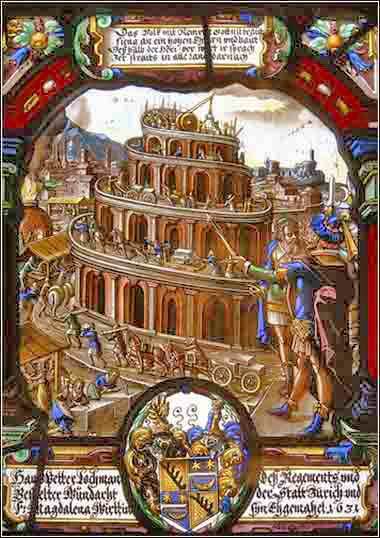 Tower of Babel, 16th century stained glass. ow the whole world had one language and a common speech. As men moved eastward, they found a plain in Shinar [Babylonia] and settled there. So the Lord scattered them from there over all the earth, and they stopped building the city. That is why it was called Babel — because there the Lord confused the language of the whole world. From there the Lord scattered them over the face of the whole earth. 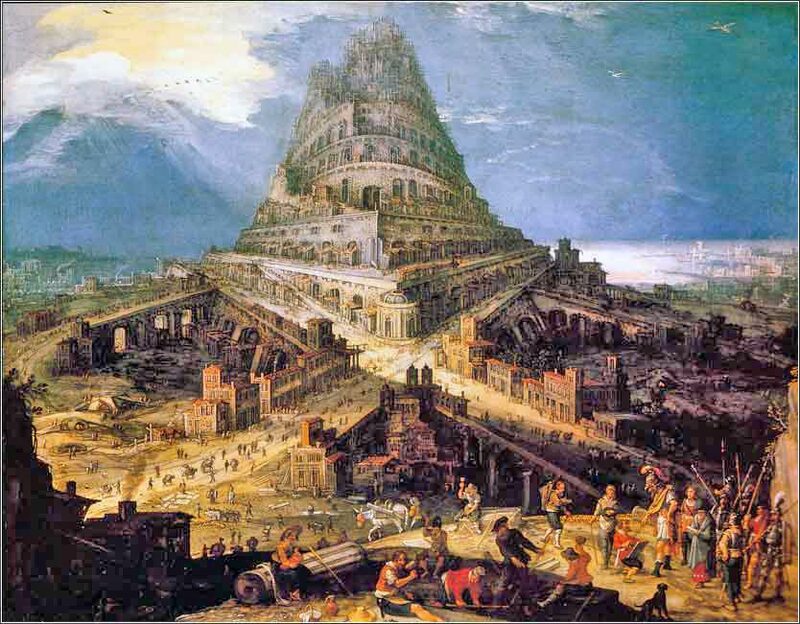 In Hebrew, the word “babel” sounds like the word for “confusion”; thus the passage says that Babel was named because it was the place where God confused the languages of the world. It is the Hebrew name for Babylon, which existed as a settlement before 2000 B.C. and, by 1700 B.C., was probably the largest city in the world. In the period when it was ruled by Nebuchadnezzar and his descendants (@ 600-450 B.C. ), it again became the largest and one of the richest cities in the world. It was a city given to grand structures, including one of the Seven Wonders of the World, the great Hanging Gardens. The story of the Tower of Babel would have made sense to anyone living in the Middle East. It was a great crossroads of trade, a meeting place for cultures with widely disparate languages, and was repeatedly conquered and reconquered by great empires. An ancient Sumerian story, which is known only in fragments, speaks of the building of a great tower (ziggurat), although it would have been 100 miles to the south of Babylonia; this was originally Sumeria but later became part of Babylon; it was certainly, at the time, the greatest architectural center in the world, and many structures were built for heathen gods. At any rate, the Tower of Babel was not built for the worship of God, but for the glory of man. It was temple dedicated to sinful pride. Even the materials used were manmade, a locally invented brick rather than stone. So God stopped them by giving them different languages and scattering them around in tribes, and the tower was abandoned.